In their debut season in the BVI Volleyball Association League, the Virgin Gorda Eagles are looking to claw their way to the league’s top prize. The Eagles walked off with a 25-19, 25-10 and 25-17 triumph to follow up on an opening night victory. 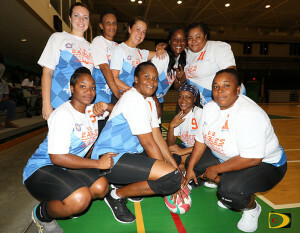 While it’s a first to have a Virgin Gorda female team in the league, Harley said they play beach volleyball every weekend and that’s where they were spotted by Raymond “Chi Chi” Fonseca, who told them from the way they play, they need to be on the hard court. “He came over, coached us and here we are,” she said. Other women’s games saw Raw Power downing Super Spikers in straight sets, 25-19, 25-12 and 25-16. Vixen needed five sets to get past Vipers, 25-16, 16-25, 25-20, 24-26 and 15-11. The male Raw Power team handed Just Dream—last year’s runner’s up—a straight set 25-19, 25-17 and 25-19 setback. Just Dream were coming off taking down defending champs Gunz in the season opener. The Gunz forfeited to Virgin Gorda in the other men’s game.